Ozone is the most powerful oxidative agent that occurs naturally. With its extra free radical oxygen molecule, ozone is able to destroy germs, viruses, and microbes that may cause surface or air contaminations. Furthermore, ozone leaves no chemical residue typical of alternative detergent or synthetic cleaners, and if handled properly, by converting ozone back to oxygen molecules, it can be one of the most effective sterilizing tools. Ozone is a powerful and natural purifier, and now with the Ozilla® Ozone Sterilizer, Genlantis has made it safer and easier than ever to use ozone gas for multiple sterilization applications. 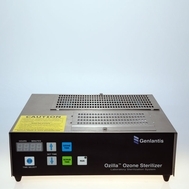 The Genlantis Ozilla® Laboratory Sterilization System is a high quality, compact and purpose-built ozone gas generator measuring 13 x 11 x 5 inches. When used properly, it is able to eliminate airborne and surface contaminants and germs. The Ozilla sterilizer is easy and safe to use, and has a novel -scrubbing- technology that removes all ozone gases at the end of each sterilization cycle, by converting ozone gas back to oxygen (see Figure 1). As an added advantage, the Ozilla air sterilizer will leave your room or cabinet odor-free and smelling fresh, clean, and ready for your next usage. 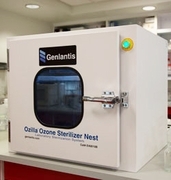 In addition to The Genlantis Ozilla® Laboratory Sterilization System, Genlantis offers two products that allow for a complete set to satisfy all of your sterilization needs: the Ozilla® Ozone Gas Detector and the Ozilla® Ozone Sterilizer Nest. The Ozilla® Ozone Gas Detector is a tool specially designed as a portable and intelligent gas detector built with the most advanced large scale integrated circuit technology. It provides accurate and reliable ozone gas detection in a rugged and easy to operate package. 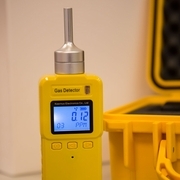 With the Ozilla® Ozone Gas Detector you can easily detect ozone gas levels in rooms or areas where the Ozilla Ozone Sterilizer device was operating, or in general to check ozone presence in desired areas. The Ozilla® Ozone Sterilizer Nest is an airtight container that allows safe and convenient sterilization of multiple laboratory items than can fit inside, such as pipettes, pipette tip boxes,glove boxes, lab coats, hair nets, and so much more. When looking to sterilize small equipment in an enclosed space for ozone gas sterilization that is guaranteed not to leak, the Ozilla® Ozone Sterilizer Nest is your answer! Figure 1. Data was generated using a calibrated ozone analyzer along with a test Ozilla Ozone Sterilizer. Samples were captured every 10 seconds in a sealed (24 x 24 x 24 inch) chamber . For the natural ozone breakdown, only the ozone generator was in the chamber. On the scrub tests the filter is present during the entire process of generation and scrubbing as well as a E. coli test plate to also monitor sterilization effectiveness. Red Line: to test the natural ozone breakdown rate, the Ozilla Ozone Sterilizer was run for 80 minutes to generate 150 parts per million (ppm) of ozone gas. The generated ozone required 28 hours to break down to 0.01 ppm (FDA safe level). Green lines: The scrub cycle tests were done in duplicate (Test #1 and Test #2 on graph). The ozone generator was run for 120 minutes to allow ozone gas to reach between 140 and 150 ppm. The scrub cycle was run until ozone levels reached 0.01 ppm, which took about 15 minutes from the highest recorded reading. The total time from ozone generation to a safe ozone levels using the scrub filter is 2 hours 15 minutes. During these tests agar plates containing 500 million E. coli were placed in the test chamber, after which a 100% kill rate was achieved during each test. 1. Excellent alternative to autoclave steam sterilization- Autoclave steam sterilization units have long been the preferred method for the purposes of sterilizing equipment. The main drawback to steam sterilization use is the harsh conditions it imposes on the items being sterilized, by exposing them to extreme heat, pressure and humidity. This method is not well suited for heat sensitive materials and instruments. There are many devices, such as surgical instruments and certain lab equipment, which are not designed to withstand prolonged heat and moisture of the steam sterilization process. This leads to the search of an alternative sterilization method: Ozone sterilization. Ozone is an attractive low-temperature sterilization alternative to steam sterilization. Ozone is a very efficient sterilizer because of its strong oxidizing properties against many contaminants and germs such as bacteria, phage, and fungus. See the Ozone Data TAB for a partial list of all of the different organisms that ozone gas has been proven to kill. 2. Cost and Time-effective- The Ozilla® can sterilize roughly up to a 2,000 cubic feet (roughly a 14 x 14 x 10 room) space at a tenth of the cost, in a tenth of the time. Only electricity, water, and oxygen are needed to produce ozone in a sterilization system. Because these components are easily and readily available, sterilization via Ozone gas is an extremely cost-effective option. To put this into a more clear perspective, the amount of ozone generated for one sterilization cycle costs less than ten cents. Moreover, ozone sterilization devices require very little maintenance other than occasionally cleaning out its air filters. 3. Environmentally Safe, Non-Hazardous- There is no environmental downside. While ozone gas is toxic it is also unstable, with a 30-minute half. Ozone reaches negligible levels well before any chemical sterilant can reach safe levels. We have conducted our own experimentation to determine that the level of ozone is broken down to 0.01 ppm (FDA safe level) about 8 hours after the scrub cycle is run when allowed to decontaminate a 10 foot by 8 foot room (total run time is 18 hours of ozone emission, 8 hours of scrub cycle). There are no toxic/hazardous residues or waste products associated with the process, and no toxic gas is left remaining in the environment. Because the ozone sterilizer produces its own sterilizing agent, the sterilant does not require any transportation or physical contact by technicians. **NOTE: Minimum O3 and Scrub cycle times can be extended. Ozilla Ozone Sterilizer Stopped my Nightmares! For those doing tissue culture, the most distressful nightmare is contamination. Cleaning the incubators, hoods, etc. is time-consuming, challenging and you never know if it will work. Besides, bleach smells awful and is hazardous. Ozilla saved the day. This portable Ozone laboratory sterilization system fits inside the incubators and hoods and in the blink of an eye, the contamination is gone. You can even sterilize the whole room (we do it once a week). We have used it with great success, not just in the tissue culture room, but also in the animal procedure room (without animals) and even in our offices, which smell fresh afterwards.